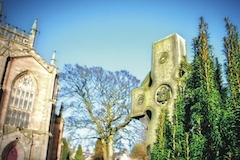 The sermon preached on Easter Day, Sunday 27th March 2016, at the 9.30am Service, in Dunfermline Abbey by Rev MaryAnn R. Rennie. 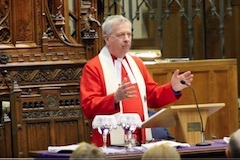 The Very Rev John Chalmers preaching the sermon during the Communion Service on Maundy Thursday 2016. 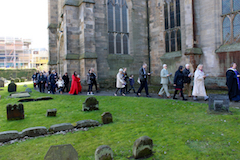 The sermon preached on Palm and Passion Sunday, 20th March 2016, at the 11am Service, in Dunfermline Abbey by Rev MaryAnn R. Rennie. 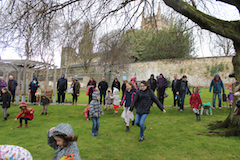 Read more"The Fickleness of Politics"
A perfect morning for our Palm Sunday Procession…..Walking round the Abbey and through the Nave via the Great West Door with the bonus of some lovely shots of the Abbey with a pure blue sky as a backdrop. The sermon preached as part of the 11am Communion Service, in Dunfermline Abbey, on Sunday, 13th March 2016 by Rev MaryAnn R. Rennie. When the immortalised Robert died in 1329 he was buried in the choir of Dunfermline Abbey. Then in 1818 during foundation work for the building was in progress, the tomb was rediscovered the remains were carefully reinterred within the new Church. 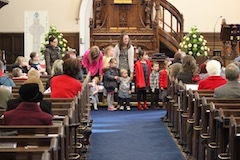 On Mothering Sunday we welcomed some of the Cradle Roll back the Abbey. The Sunday School handed out a bulb to everyone in the congregation to plant and grow. We look forward to the pictures of the flowers.